Zenith Cosmetic Clinics are proud to offer the world’s leading brand of hyaluronic acid facial fillers, Juvéderm! Juvéderm® is the brand name for a range of facial fillers that can treat everything from fine lines to deep folds and wrinkles. As we grow older, our skin loses moisture and elasticity and begins to show the signs of ageing. 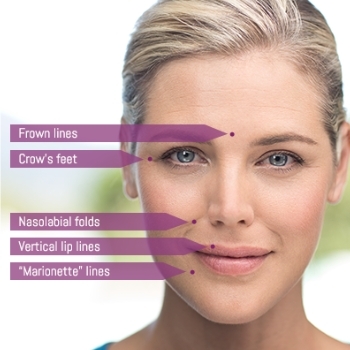 Juvéderm® facial fillers can gently ease wrinkles and add volume in a subtle way, to give you a more youthful glow. With treatments lasting around just 60 minutes and starting at just £199, get in touch to arrange your consultation with Zenith today. What Are Juvederm Facial Fillers? Juvéderm® is a hyaluronic acid facial filler which is smooth and long-lasting. It is used to fill facial lines and wrinkles and add subtle volume. Many moisturisers contain hyaluronic acid, but facial fillers containing hyaluronic acid, like Juvéderm®, are the only way to replenish the hyaluronic acid deep within the skin. This is because Juvéderm has the ability to integrate with your own facial tissue to get natural-looking, beautiful results. Juvéderm is made by one of the world’s leading brand of hyaluronic acid facial fillers, Allergen. With over 60 years of experience in stringent product manufacturing, you can be confident that Juvéderm can help give you beautiful and long-lasting results! If you would like to find out more about Juvéderm facial fillers, arrange your consultation in Nottingham or London today. What Are Facial Fillers Used For? Facial fillers are used to smooth out lines and wrinkles and fill out any hollowness in your face - a common side effect of your skin ageing. Juvéderm® was developed to be smoother than most hyaluronic acid dermal fillers. This makes it easy to inject and gives the face a very natural look and feel once it’s in the skin. It is also formulated with an anaesthetic to make the treatment as comfortable as possible. Juvéderm® wrinkle fillers mimic the lifting effect of your skin’s natural hyaluronic acid to keep the skin hydrated and elastic, with results that can last up to a year. Am I A Suitable Candidate For Lip Fillers? One of the best things about lip fillers is that there are so many options available to you; whether you want more volume, more definition or want to create a different shape to your lips. Almost anyone is suitable for lip fillers, and with it being a temporary procedure it means that you can change the shape and overall look of your lips over time. Dr Maini will help you achieve your goals of fuller or more shapely lips. Who Is Juvéderm Suitable For? • If you’re pregnant or breastfeeding. • You have bleeding disorders. • Have known allergies to gram-positive bacteria. • Previous allergic reactions that required hospital treatment. • Have a history of keloid scarring treatment. Juvéderm can be administered by several different practitioners at our clinic. The clinicians who most frequently inject filler are Doctor Maini (a practitioner of the 8 point facelift, who has many years of experience), Dr Lakhani (an advanced injector of both Botox and fillers), and Pauline - our Senior Aesthetic Nurse. Pauline similarly has many years of experience and happy patients. Each clinician will assess your requirements in full before suggesting a treatment plan. It may be that an alternative filler (such as Restylane®, Radiesse®, Sculptra® or Voluma®), or a different treatment (such as a PRP Vampire Facial), might be more suitable to get the best results for you. If your clinician does decide a dermal filler is the best treatment for you, they will inject the product into your face using tiny needles. The treatment is not painful but you might feel a sharp scratch from the needle. • Pain, tenderness and itching at the injection sites. Most of these will diminish within 48 hours, with the exception of mild bruising, which may take 2 to 10 days to gradually fade. Makeup is often sufficient to cover most mild bruising, making this an excellent treatment choice. You will see results from your fillers immediately after your treatment, and the look continues to improve for 1 to 2 weeks. Juvéderm is FDA-approved to last up to one year, although how long your fillers last will vary depending on where the face is injected and how much cosmetic filler is used. Our Juvéderm® dermal fillers start from just £199, but this will be dependent on your individual treatment plan, and can be discussed during your initial consultation. We also offer Juvéderm® fillers at both our Nottingham and London based clinics. Arrange your consultation today! One of the best things about these facial fillers is that there is very little downtime needed after having Juvéderm injections. You can usually return to normal activities straight away. If you have any questions surrounding aftercare or side-effects you can ask these during your consultation. Here at Zenith Cosmetic, we offer both your consultation and facial fillers treatment in our clinic based in the heart of Nottingham. Don’t hesitate to get in contact with our team, we’re here to answer any of the questions you have around the treatment. Arrange your consultation in Nottingham today. Our Juvéderm facial fillers service is also available to patients in London, so if this location is more convenient for you, get in touch with our team to arrange a consultation today! If you do have any questions prior to your consultation, our team is more than happy to help. Generally, facial fillers (or dermal fillers) are used to fill out wrinkles and creases in the skin. However, they can also be used to add volume and definition in lips and cheeks. Will juvéderm fillers look natural? Because of the nature of Juvéderm facial fillers, it has the ability to integrate with your own facial tissue to get natural-looking, beautiful results. We always like to make sure our patients are as comfortable and relaxed as possible during treatments. These fillers contain the anaesthetic lidocaine, which can help reduce any discomfort you may feel during treatment. Juvéderm is FDA-approved to last up to one year, although how long your fillers last will vary depending on where the face is injected and how much cosmetic filler is used. ©2019 Zenith Cosmetic Clinics All rights reserved. Registered with Care Quality Commission - See our latest report here or download a PDF here. Serving clients from London, Leicester, Derby, Nottingham, Nottinghamshire, East Midlands and throughout the UK.